So far, we’ve covered WhatsApp and Facebook Messenger. This time, we bring you Telegram, WhatsApp’s bolder, more extroverted cousin. Key functionalities: Send and receive text, audio, photo, and video messages; share files and geo-locations; communicate through “secret chats” that are fully encrypted, leave no trace on Telegram servers, self-destruct, and do not allow forwarding; create groups (up to 200 members), super groups (up to 5,000 members, public or private) and public and private “channels” that have no member limits and can be used to share information and files (one-way only); develop Telegram apps and chatbots through its open API and integrate bots into the platform as users to provide specialized functions. Totally free to download and use. Pros: Extremely secure system with a wide variety of ways for the user to share and receive information; large group and channel functionalities allow for easy transmission of information, files, and locations in real-time; username-based identity means that you don’t need to give away your number; lean data usage allows for rich functionality even in low-bandwidth environments. An open application program interface (API) means you can develop enterprise-level management apps on top, and even a bot to manage channels if you’re so inspired. All in all, a really great app for those of us working in international development and trying to crack the community and youth engagement nut, so to speak. Cons: Not as widely used as WhatsApp, though growing quickly at more than 100 million users per day. Lack of a user guide makes optimizing your user experience challenging. Kristen: I love Telegram. Fun fact: It’s a nonprofit! The large group and public channel features are what we’ve all been craving, and missing, in WhatsApp, and the open API is the cherry on top of the already-delicious Telegram sundae. I can’t wait to work this into a project’s communications toolkit and really dig into how to best maximize all the rich features this app contains. 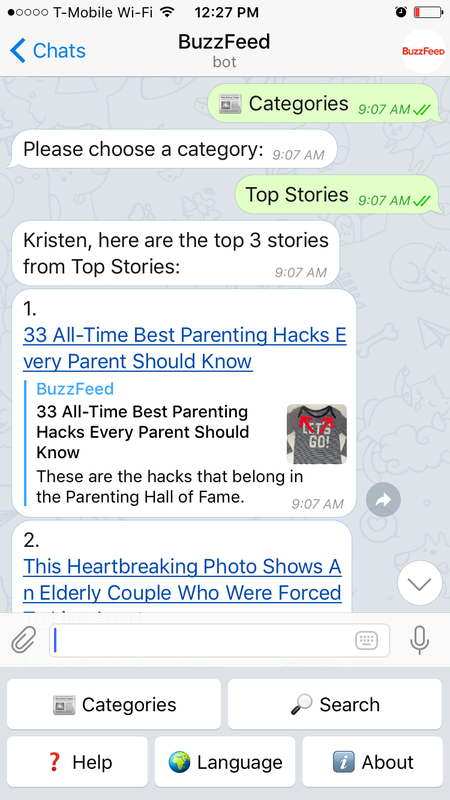 So far my experience with the bots has been unsatisfactory (that is true across all the apps we’ve reviewed), but as that feature develops I think it could be incredible helpful for personalized, rich information sharing—think of it as the interactive voice response of the smartphone era. As WhatsApp goes more commercial (especially with the recent Facebook data-sharing announcement), I think we’ll see more of our target users migrating to different apps. Here’s hoping they migrate to Telegram. Anand: I don’t know if it’s just me, but I seem to have trouble adding or finding contacts on almost all the messaging apps we’ve tracked during App-a-Thon (in WhatsApp, for example, you can only add contacts via your phone’s contacts list, not the app itself). Telegram is no exception. But once you find your people, the interface is clean, simple, and fast. The fact that they have built user interfaces for so many environments—mobile, desktop, browser—is just perfect. It’s the kind of feature that gives Telegram a fighting chance at replacing systems like Slack to be the go-to (and secret) internal chat/knowledge management platform for enterprises. It even has a drafts function for unsent messages! Telegram also offers searchable cloud storage for chats and media files. For those of us who fantasize about a post-email work culture, Telegram might well be a godsend. While Telegram is unlikely to draw younger users away from WhatsApp, it is likely to soon expand its numbers among more tech-savvy, privacy-obsessed development actors—political activists, nongovernmental groups, etc. But more broadly, we’ve been working with a number of project teams that are trying hard to streamline their work flow with new tools like Slack and Trello. For those projects with access to some basic software development capacity, Telegram has the potential to become a one-stop communications and monitoring and evaluation management tool, especially given its open API and focus on security. Interested in hearing more about other the other apps we tested in App-a-Thon 2016? Subscribe now to receive a weekly digest of our newest blogs sent directly to your inbox!